Nothing can quite match the timeless popularity of a cigar. Even as cigarette sales decline, cigar sales continue to grow. Why? Because cigars are so much more than another type of smoking. Like a fine whiskey, cigars are an indulgence. They are a luxury, not a habit. Whether you’re just getting into cigars or have been enjoying them for years, investing in some cigar accessories can make your smoking experience even better. 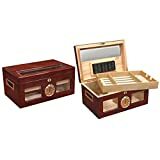 One of the first cigar accessories you should buy is a cigar humidor. We’ll show you why a humidor is important to enjoying your favorite cigars. As any serious cigar smoker knows, cigars are incredibly delicate. Any changes in humidity or temperature can seriously damage your smoking experience. In their original packaging, cigars can last up to a month at maximum. So, if you plan on only buying small amounts of cigars and smoking them soon after purchasing, you don’t need to worry too much about storage. But that really limits your ability to collect and try out different types of cigars. Plus, no one wants to have to throw out cigars that dried out before they could be enjoyed. A humidor is one of the most important cigar accessories because it keeps your cigars fresh. Your cigar will be ready to smoke long beyond the one-month expiration date. In fact, with a good humidor your cigars will be fresh for up to five years. Plus, you can actually save in the long run. You can buy cigars in bulk, knowing you can enjoy them at your leisure. You won’t have to throw out dried out cigars — a cigar connoisseur’s nightmare! Storing your cigars in a humidor does more than just keep them fresh. It can actually improve their flavor. It is the same idea as aging wine. As the cigar ages, the flavourful elements of the cigar, such as sugars and oils, intermingle more with the tobacco. This mellows and enriches the overall flavor. Every type of cigar will age differently. For most cigars, aging them between 12 to 24 months is ideal. It can be hard to avoid the temptation while you’re letting them age, but believe us, it’s worth it. Since cigars last so long in humidors, you can experiment with the aging periods. Aging your cigars for different amounts of time will allow you to discover your ideal flavor. No matter your individual tastes, cigars must be aged carefully. Without enough humidity, they’ll dry out. Too much, and they can grow moldy. That’s why a properly calibrated humidor is so important among cigar accessories. If you have properly set up your humidor, you can age your cigars to perfection. The best cigar humidors are made from Spanish cedar. This type of wood is exceptional when it comes to maintaining the perfect levels of humidity, but it has another important purpose. Spanish cedar is also great when it comes to repelling tobacco beetles. These little pests can sometimes be transported with your cigars, especially eggs. Even more effective than the Spanish cedar is the temperature control. Spanish cedar is very porous, meaning it won’t trap heat. The temperature will remain relatively stable, as long as you keep it away from heat sources. The cool temperature that is ideal for storing cigars also prevents tobacco beetle eggs from hatching. Tobacco beetles thrive in temperatures above 74 degrees. So with a humidor, you can keep your cigars cool enough that these beetles can’t function. With a humidor, you can rest assured knowing your cigars are safe. A humidor protects your cigars from the damaging effects of UV radiation. UV radiation can damage the outer wrapping of your cigars, making them more fragile. It can also damage the cigar overall, especially since exposure to sunlight also means increased heat. In addition to the risk of tobacco beetles and mold, higher temperatures speed the aging process. It can affect your cigar’s flavor. UV radiation isn’t a significant problem in the short term. If you have a glass-topped humidor on your desk for storing cigars you plan on smoking soon, you won’t notice any difference. Plus, the glass plating on humidors often comes with UV protection. But, if you are storing cigars over the long term and aging them to improve flavor, UV radiation could become a problem. So, a humidor will help keep your cigars at their best by protecting them from harmful UV radiation. One of the best things about smoking a cigar is how stylish the occasion feels. Whether you’re giving a traditional toast to a new baby, celebrating a birthday, or just sitting back and unwinding, a cigar humidor makes any cigar feel special. This is because they are generally impeccably designed. With high-quality wood, such as Spanish cedar, and tasteful decoration, cigar humidors make storage more stylish. There is no comparison between grabbing a cigar from a Tupperware container in the fridge or opening your humidor and selecting a nicely aged one. A stylish humidor lets you take pride in your cigar collection by housing it in an appropriate way. A humidor is a uniquely useful accessory because it provides both form and function. It vastly improves the storage of your cigars, as we went through above. And it adds style and charm to your smoking experience. 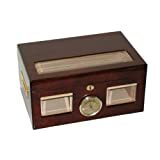 If you already love cigars, you will love your cigar humidor. By keeping your precious cigars fresh and letting you age them to perfection, a cigar humidor will improve your smoking experience. The difference is incomparable. Then, a humidor allows you to protect your cigars. Whether its tobacco beetles or UV radiation, you can keep them free from damage. And finally, you can add style to storing your cigars. Cigars are classic and timeless in their charm. The way you store them should be equally charming. Check out our guide to the best humidors to find the perfect one for you.